IWAKURA Tomomi and ŌKUBO Toshimichi visit Tsurumaru Castle in Kagoshima with the imperial rescript that says that Hisamitsu should join the new government. However, he coughs violently and tells Tomomi who reads the rescript aloud that his condition prevents himself from doing so. All in the room except him are surprised with it but he seems to feign illness. Tomomi warns him but he goes out of the room with the help of KAIEDA Takeji. The reason why the government tries to urge him to join the government is nothing but for abolishing domains and establishing the prefectures instead. As the government gets in finaicial trouble, it needs to centralise the country to make the government collect tax from the people. But it needs to prepare for the worst in case of the samurais start a riot under the name of their lords. 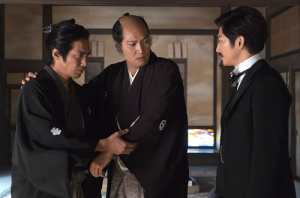 Shimazu Hisamitsu (Munataka Aoki, centre) goes out of the room with KAIEDA Takeji (Mitsuomi Takahashi, left) but Ōkubo Tochimichi (Eita) suspects that he feign illness. Takamori proposes the plan of selecting elite samurais to establish the Imperial Guards to Tomomi and Toshimichi. He attempts to win them over to the government's side and Toshimichi leaves it entirely to him. 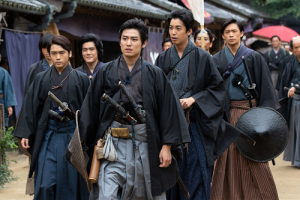 When Takamori returns home with Jūdō, they find young samurais as Kohei, NAKAMURA Hanjirō, BEPPU Shinsuke and KAWAJI Toshiyoshi practice swordsmanship. While practicing, Kohei tells Hanjirō who gives lessons severely that he has no need to do so because the days of samurai will end soon. Though His words make Hanjirō unpleasant, Takamori tells them that the days of new samurais as the Imperial Guards and policemen will come. So they resume their practice with joy. On the other hand, Masu says that she won't go to Tokyo though her husband Toshimichi advises her to live with him. She suspects that another woman takes care of him and he won't return to Kagoshima any more. 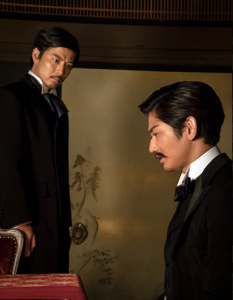 At Tsurumaru Castle, Hisamitsu lies down in his room and will not listen to what Toshimichi says. He still encourages him to go to Tokyo and tell him that he won't regret it. Then Hisamitsu gets up suddenly and shouts to Toshimichi. "What do you think you are? Why do you make such an insulting remark to me, Ichizō?" Again, he vents his ill humour on Toshimichi. "You plot to make me stay in Tokyo forcibly and suppress Satsuma in my absence, don't you?" "I serve the Emperor, not the Shimazu clan now. You will fail to keep up with changes, sir". He adds that there is a place for Hisamitsu in the government and leaves there saying,"I must say good-bye to you, Lord Shimazu Hisamitsu (*)". Hisamitsu who is left alone feels that he is abandoned by Toshimichi. Takamori and Kikujirō sit on verandah and sees falling snow. It is the snow Kikujirō sees for the first time because he was born and brought up in Amami Oshima. Takamori tells him to study well for the future. In 1874, Takamori goes to Tokyo accompanied by Kumakichi. During his short absence, carriages and rickshaws come into use in Tokyo. Then he is invited by Toshimichi to Western-style dinner. 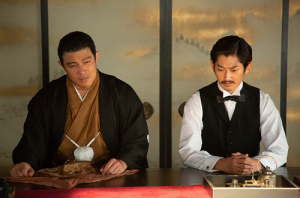 And the government officials as KIDO Takayoshi, ETŌ Shinpei and GOTŌ Shōjirō conflict opinions at table. It seems that the government is not monolithic. After the dinner, Toshimichi takes stomach medicine brought by his concubine O-Yū and says it's the actual situation of the government. Toshimichi worries about the delay of abolishing domains will cause the riots of the samurais. Takamori tells him that each samurai is afraid of losing the domain he serves but Toshimichi objects that it is hard to modernise Japan without abolishing them. Takamori says it needs to take the time to realise his idea but Toshimichi says there is no time. Beside he tells his friend that he should take the initiative in it as Takamori asked him to establish a new countrry and he does it just now. Then he eats one of the slices of takuan (yellow pickled radish) on a dish and drinks a cup of black tea. He likes the combination. Then Tatsukuma, son of Toshimichi appears and he wanted to eat Western cuisine also. O-Yū reproves her son who looks like his father. The samurais of various domains including those from Kagoshima visit Tokyo. Hanjirō, Kohei and other samurais from Kagoshima have cut their topknots. Takamori takes them to a tenement house where he lives and they are surprised with it. He doesn't like to live in a residence and lodges in a section of the house with Kumakichi. He is familiar with other dwellers, one of whom says that he is different from other officials who live in luxury. In the government, the meeting is in confusion over the expense of the Imperial Guards but Takamori emphasises that the officials should live frugally. And unlike others, he doesn't eat deluxe food but rice balls made by Kumakichi at lunchtime. Both SANJŌ Sanetomi and Tomomi feel embarrassed and tell Toshimichi to persuade him. That night he visits the tenement house where Takamori lives. 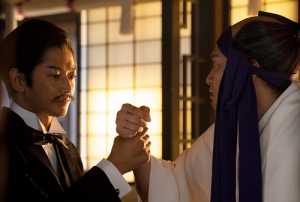 Toshimichi cannot stand his situation and drinks shochu (clear liquor) though Takamori worries about his stomach condition. Then he tells him that other officials are confused with his attitude. 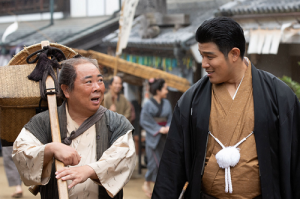 Though Takamori says he doesn't stay in Tokyo to live above his means, Toshimichi says his idea of helping people is nothing but lip service. He also says living in luxury is a method of diplomacy and Japan should copy Western countries now. And he sees his pocket watch and leaves saying he trusts him. One rainy morning, Kumakichi tells his master who is about to go out that unlike Shimazu-ame (***), the rain in Tokyo depresses him. And behind their back, Toshimichi attempts to win Takayoshi over to his side to lead the government. Takayoshi worries about whether Takamori agrees with it or not but Toshimichi tell him not to fear it. At last the government receives the imperial rescript of abolishing domains but it makes the officials from the domains of Hizen (Saga) and Tosa and they blame Toshimichi. They are about to go out of the room to resign from their positions and told to calm down by Tomomi. But Toshimichi says coldly that he never minds that the resignation of the officials who encumber him. However, Takayoshi blames him that Takamori is not there. Toshimichi is at a loss but Takamori appears then and excuses his delay due to seeing military drill of the Guards. And he tries to stop the officials who are against abolishing the domains. 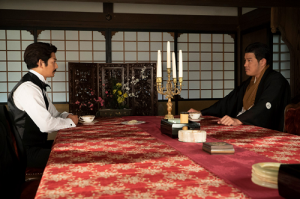 Toshimichi insists that the government can be managed by the officials from Satsuma and Chōshū only but Takamori denies it and persuades him to establish the government that is trustworthy. He says if it fails, he will take responsibility for everything includes riot. Soon after the domains are abolished and lords lose their footholds. (*) He calls him reservedly on purpose. (**) The purple headband of Hisamitsu was used by high-ranking people when they were ill in former times. (***) The rain fall in Kagoshima that is thought to be a good omen. In the episode 39, SAIGO Kikujirō, son of Takamori rides in a carriage. Carriage was not common in Japan until the end of the Tokugawa shogunate except foreign settlements. There are some reasons why it was not popular. The first of them is that the country is mountainous and there are few plains. And the Japanese made oxen pull carriages for noble people instead of horses. 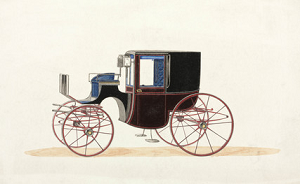 So a carriage in the latter half of the 19th century was regarded as a symbol of westernisation of Japan. The one that Kikujirō rides in may be a Brougham (coupē). At present, the new ambassadors to Japan usually rides in the carriage of the Imperial Household when they make a first visit the Imperial Palace. ŌKUBO Toshimichi liked drinking coffee, green tea and black tea. In this series, he drinks black tea with tsukemono, Japanse pickled vegetables. It’s a strange combination but it's true that he liked tsukemono also. And some high officials of the government wear frock coats in the episodes set in Meiji period. Most of them cut their topknots and slick down their hair. 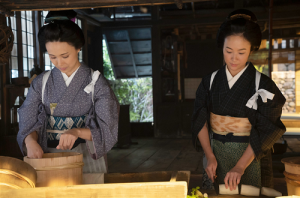 But SANJŌ Sanetomi and IWAKURA Tomomi wear traditional clothes because they are aristocrats. And only ETŌ Shinpei wears kimono though he cuts his topknot also. The images are from Wikimedia Commons and the official website of "Segodon".